Cup holders Nigeria have begun the race towards a successful defence of their Africa U23 title in Tunisia on Wednesday when they take on their Libyan counterparts in a first round, first leg encounter of the qualification series. 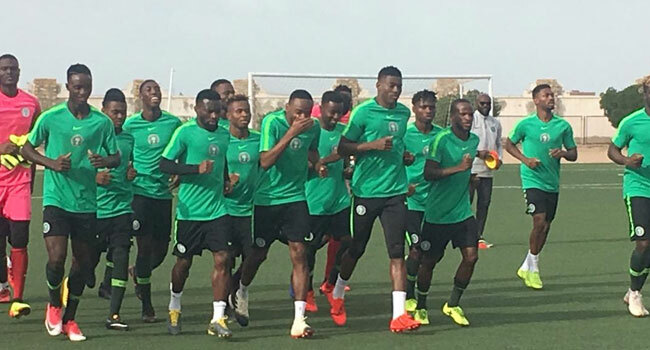 Wednesday’s encounter, which kicks off at 3:00 pm Tunisia time (same as in Nigeria), on the artificial turf of the Ben Guerdane Stadium in the city of Ben Guerdane, will see Nigeria’s Head Coach, Imama Amapakabo throw in his best dice for a good result ahead of the return leg in Asaba on Monday. Amapakabo will work with a good blend of homeboys and overseas-based professionals. Lobi Stars’ trio of John Lazarus, Ugochukwu Anumudu and Ebube Duru are joined by Enyimba’s Dare Olatunji and Stephen Egbe, and Wikki Tourists’ goalie Adamu Abubakar, amongst others. Former U17 World Cup winners Taiwo Awoniyi, Kelechi Nwakali, Kingsley Michael, Orji Okonkwo, Chidera Ezeh and Samuel Chukwueze are among the Europe–based who teamed up with the delegation in Tunisia. Victory on Wednesday would pave the way to the final round of qualifiers for the champions, which is due in June. The Confederation of African Football has appointed Ghanaian officials to take charge of proceedings, with Daniel Laryea as referee. Acheampong Brobbey is the assistant referee 1 while Emmanuel Allou is assistant referee 2 and Adaar Abdul Latif is the fourth official. Amir Osman Mohamed Amid from Sudan is the match commissioner. Nigeria is the only African country to have won gold, silver and bronze medals of the Men’s Olympic Football Tournament. Gold was the harvest at the Centennial Games in Atlanta, USA, and silver came in Beijing, China in 2008. The bronze medal won by the Olympic Eagles at the Games in Brazil in 2016 was the only medal won by the entire Team Nigeria at the event. Africa’s flag-bearers in the Men’s Olympic Football Tournament of Tokyo 2020 will emerge during the 3rd Africa U23 Cup of Nations to hold in Egypt 8th – 22nd November this year.